The second largest footwear consumer in 2015 (according to the latest edition of the World Footwear Yearbook) with a total of 2 759 million pairs consumed last year, registered an increase of its footwear imports during the first half of the current year. European Union imports of footwear reached 2 142 million pairs, going up by 2.4% from similar period in 2015. In value terms imports totaled 22 360 million euros, a 5.5% growth compared to the first semester of the previous year. 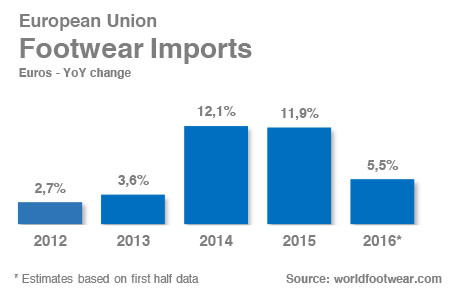 Footwear imports by the EU have been consistently increasing in the last few years, and after impressive two digits growth rates in 2014 and last year, worldfootwear.com estimates based on the first semester performance point to a 5.5% growth, consolidating import flows. In value terms, a significant part of the trade relations taking place in the European Union engage two countries from the region, hence why intra EU imports play the most significant part (57.7%) in total imports. Out of the 22 360 million euros worth of imports, 12 911 million euros refer to internal EU trade. The reality is completely different if volumes are analysed, as intra EU imports only refers to 760 million pairs, a 35.5% share in the total 2 142 million pairs entering the EU countries. The increase in imports in value terms occurred across all main partners, although in volume, some countries presented declines (Netherlands, France, UK, Romania). Total EU imports from outside the region have totaled 1 382 million pairs, with a global value of 9 448 million euros, a decline of 1.1% in quantity terms and a slight increase of 1.5% in value. 6 out of the 10 main EU suppliers are Asian countries (China, Vietnam, Indonesia, India, Cambodia and Bangladesh), 2 African (Tunisia and Morocco) and 2 European (Switzerland and Bosnia and Herzegovina). Imports from China, the origin of 7 out of each 10 pairs of shoes entering the EU from outside the region, fell by 3.9% in quantity and 5.0% in value. A strong decline in the imports coming from China, with the lost quota not being taken by just one country, but several. Vietnam seems to be on that list, as imports from this Asian country have increase by 6.8% in quantity and 12.2% in value. The same seems to be happening with Cambodia (+7.8% in quantity and +10.6% in value), Bangladesh (+13.4% in volume and +7.9% in value), Switzerland (+20.5% in quantity and +26.8% in value) and Bosnia and Herzegovina (+12.1% in volume and +4.4% in value). Countries such as Indonesia (-5.4%), India (-2.8%), Tunisia (-4.3%) and Morocco (-1.4%) have registered declines in the quantities entering the EU. According to the latest estimates by the European Commission, economic growth in Europe is expected to remain modest this year. In fact, this entity forecasted that in 20116 the European Union growth will be of only 1.8%. As such, imports of footwear have registered a performance in the first semester much more intense that the economic growth rates for the region would suggest.